Indeed, in the United States, people with disabilities are 2 to 4 times more likely to die or sustain a critical injury during a disaster than people without disabilities.3 This increased level of risk is due to the difficulty that individuals with disabilities have evacuating without assistance,4 accessing lifesaving medical equipment during power outages,5 and accessing accurate emergency information and effective emergency services.6 The still-unfolding damage from Post-Tropical Cyclone Florence,7 the recent wildfires ravaging the western United States,8 and the one-year anniversary of Hurricane Maria’s reverberating trauma9 in Puerto Rico are all potent reminders of the heightened perils those with disabilities face during extreme weather events. The now nearly 1 in 410 Americans with disabilities have complex access requirements and functional needs during times of natural disaster. Unfortunately, these needs have failed to gain significant notice. The noise of a White House intent on neglecting its responsibility to the health and safety of vulnerable U.S. communities during disasters and of price gouging11 for lifesaving medication in the wake of emergencies, as well as the always prematurely fading media spotlight12 on the never-ending aftermaths faced by disaster-torn communities, serve to detract from making the needs of people with disabilities a national policy priority. Natural disasters such as Post-Tropical Cyclone Florence and Hurricane Maria affect people with disabilities of all ages. In addition to harming individuals with existing disabilities, storms also affect those who acquire disabilities17 as a result of disaster-induced trauma.18 Effective preparedness, response, and recovery infrastructures require a fundamental rethinking of disability programming—from early childhood education to aging services, all of which require a trauma-informed framework to meet the needs of affected individuals.19 A recent study conducted by The George Washington University (GW) revealed that at least 2,975—not 64, as previously reported—people, the majority if not all of whom were likely U.S. citizens—lost their lives20 due to Hurricane Maria, making it the second deadliest hurricane21 in U.S. history. This underscores the urgent need to dramatically reform the nation’s preparation for and response to emergencies. Every day that response and recovery policies are not inclusive of individuals with disabilities, millions of U.S. residents are needlessly put in harm’s way. When there is a lack of proper planning and qualified personnel on the ground to help individuals with disabilities and their families access necessary services and supports, what often results are violations of the civil rights of people with disabilities. As witnessed in Hurricane Irma,34 multiple homeless individuals who were thought to have mental illnesses were tracked down and arrested and committed against their will. Proper planning, service coordination, and engagement with the disability community could have and should have prevented this. Following the George W. Bush administration’s reprehensible, mismanaged response to Hurricane Katrina, no fewer than nine congressional hearings were held to get to the bottom of what went wrong in order to ensure adequate oversight in the future and prevent the United States from again experiencing that level of avoidable devastation and loss of life.41 Out of those hearings came the Post-Katrina Emergency Management Reform Act of 2006, which reorganized the Federal Emergency Management Agency.42 The agency adopted a more inclusive mission and established a better-integrated emergency management framework to remedy response gaps, better address unmet needs, and reduce community-specific vulnerabilities to disaster threats and hazards.43 This included the establishment of the new position of director of the Office of Disability Integration and Coordination (ODIC) and required disability inclusive emergency preparedness, response, and recovery plans. Under the Obama administration in 2010, FEMA established the ODIC to further incorporate the access and functional needs of individuals with disabilities in all aspects of community emergency planning and management.44 The ODIC ensured that each of FEMA’s 10 regions had a coordinator whose role was to help organize and direct grassroots advocates and local, state, and federal governments in linked activities and efforts. 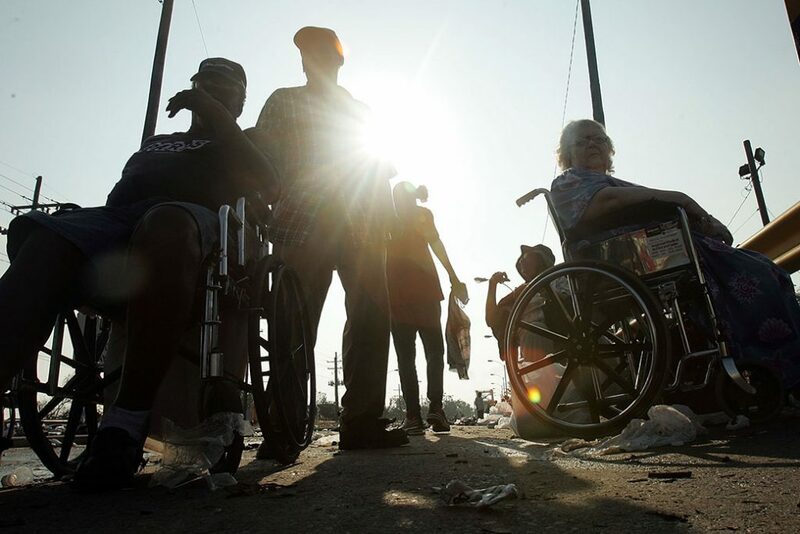 Clear coordination and communication between local, state, and federal officials ensured that FEMA’s Disability Integration Advisors could connect community-based disability organizations—such as Centers for Independent Living, Developmental Disabilities Councils, and Protection and Advocacy agencies—with the necessary government officials to carry out activities such as distributing wheelchairs or helping individuals connect with home- and community-based service providers. Ensure that evacuation services and shelters are fully accessible to people with disabilities, including individuals who have service and emotional support animals. Require the use of certified American Sign Language (ASL) interpreters at all press conferences detailing news related to an ongoing emergency. Ensure that disseminated preparedness, response, and recovery information is available in alternate formats—including Braille and through highly qualified ASL interpreters. Require the creation of state integration specialists within state emergency preparation agencies to make sure that no population, especially individuals with disabilities, is overlooked. Coordinate evacuation processes for nursing homes, hospitals, and prisons to ensure that those who are under state supervision have access to the supports and services necessary to evacuate safely. Provide Centers for Independent Living and other disability service providers access to federal funding for response and recovery efforts. Restore the number of Disability Integration Advisors sent out for each disaster to a minimum of 60. Extreme weather risks and vulnerabilities57 for people with disabilities are escalating in a rapidly changing climate.58 Storms are becoming more powerful, heat waves are longer and hotter, and floods are more frequent and dangerous. Centering people with disabilities in all emergency preparedness, disaster response, and recovery efforts is not only a moral imperative—the changing climate demands it. To be truly inclusive of and responsive to the diverse needs of people with disabilities during disasters, federal, state, and local leaders must fundamentally reimagine their current preparedness and recovery framework, as well as their disability programming—from early childhood education to aging services. The hard lessons learned recently in Puerto Rico59 and from the Northern California wildfires60 demonstrate that when people with disabilities are not at the table, they are disproportionately harmed. Clearly, what’s at stake is the long-term health, well-being, and resilience of the disability community. Rejane Frederick is an associate director for the Poverty to Prosperity Program at the Center for American Progress. Rebecca Cokley is a director for the Disability Justice Initiative at the Center. Hannah Leibson is a former intern for the Disability Justice Initiative. Eliza Schultz is a former research associate for the Poverty to Prosperity Program. The authors would like to thank Rebecca Vallas, Katherine Gallagher Robbins, Miranda Peterson, Cathleen Kelly, Guillermo Ortiz, Enrique Fernández-Toledo, Donovan Hicks, Heidi Schultheis, Ryan Collins, Zahra Mion, Julia Cusick, Carl Chancellor, Meghan Miller, and the rest of the Center’s stellar Editorial team for their contributions to this issue brief.